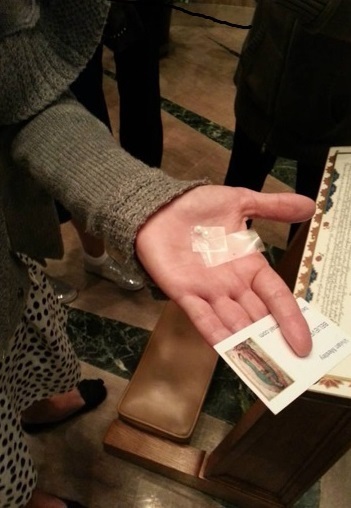 Pilgrims find Holy Glitter/Escarchas and pearls while visiting Missionary Image of Our Lady of Guadalupe. August 23, 2013 From [here]. Gold Glitter and Healing through The Missionary Image. Reported at Escarchas of Guadalupe's [Facebook]. Missionary Image Guardian Vivian Mestey from Woodbridge, Virginia reported two wonders during a Visitation of the Missionary Image. Gold glitter came from the Image and a cancerous tumor shrunk. In the past, the Missionary Image has wept tears on many occasions and hundreds of people have felt a heartbeat in her womb or heard it through a stethoscope. Vivian reported that during her Visitation the Image wept and that gold glitter came from the Image. It looked like golden grains of sand. Some fell to the floor around the people and they picked it up with their finger tips. 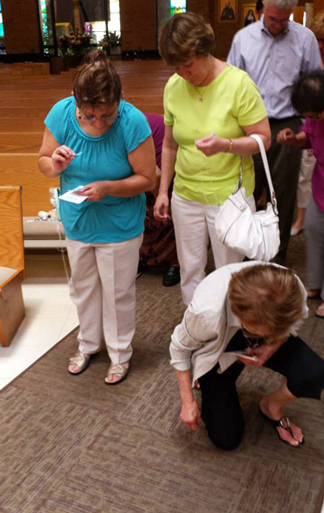 Vivian prayed over a woman named Sharon, who asked for prayers for her pancreatic tumor. Sharon wrote to Vivian: You had your hand over my pancreas, and suddenly, I felt (you felt it, too) a rolling movement in my abdomen. It felt like the movement of a fetus inside your womb in the third trimester. There was oil on the Image, and glitter, and Our Lady’s hands were so warm. The next morning, I had a surgical procedure done. The consent I signed was for removal of a cancerous tumor on my pancreas. When the doctors performed the procedure they found the tumor was half the size that the CT and MRI had shown, and also it was not malignant, but precancerous. They could not believe what had happened to the tumor. A miracle, a special blessing from Our Lord and Our Lady was granted to me, their humble servant. [See/view] large copy of above grace of Holy Glitter/Escarchas and pearls. [Here] is another example of pearls found with Our Blessed Mother. Learn more about these events [here]. Also information on hosting a visitation [here].